Graffiti is unsightly at best, but, if you’ll excuse the pun, we only need to scratch the surface to uncover deeper issues. Human nature as it is, as soon as the first graffiti appears, so does an invitation for “artists” to add to it. A once beautiful, calm environment quickly becomes littered with a cacophony of unpleasant or obscene images. The longer it is left, the more problematic and costly it is to remove. For businesses and organisations involved, they now suffer the consequences of the impression it leaves to all who see it. You’ve made the decision to remove graffiti, now what? Do you call in the professionals? Do you try to remove graffiti yourself? Whilst time is of the essence, it’s at this point you need to spend some time on research, the results achieved will depend on it. There are valid reasons not to attempt graffiti removal yourself. The first and most important is the health risk. Many of the paint/spray removal products available on the market are hazardous to your health and the health of any individual in the area. Solvents available can cause respiratory problems and eye damage if not handled with due caution. Many graffiti removal products are toxic, flammable and damaging to the environment. The key to success is to obtain a comprehensive understanding of the media used both within the graffiti, and for its removal. Money spent on the wrong product will be a waste of time and effort and could make the situation worse. Of equal importance, given the labour required to remove the graffiti, you will probably be disappointed with the results. Professional graffiti removal companies should have the expertise and the techniques for optimum results. Continuously advancing techniques for effective graffiti removal have made the process faster, cleaner and more successful than ever before. In the past, and sadly still today, some companies have treated graffiti using harsh methods that whilst removing graffiti, damaged the surface underneath as well as the environment. The results can be as unsightly as the graffiti. A reputable, professional graffiti remediation company will consider the media used, the surface it has been used upon and the optimal techniques to employ for the best results possible. Get Your FREE graffiti removal estimate in 3 easy steps. Additionally, an experienced graffiti removal company will be fully insured and have a programme of continuous investment in equipment, training, and techniques. Ideal Response’s enviable reputation in the cleaning industry has grown because of consistently good results and of course, great customer service. With a solid foundation of 15 years’ experience in the cleaning industry, we have been able to develop and enhance each of the services we provide. Speed is of the essence! If graffiti is left on a surface for long the damage will probably require more extensive remediation work and specialist treatment. A specialist paint softener will prepare the paint for easier removal and avoid the need for harsh and damaging treatment. The paint softener used by Ideal Response is pH neutral and free of chlorinated solvents. We then have a range of options available, our choice is informed by the specifics of each situation. TORC – A combination of water and granular stone applied in a vortex to draw paint out of hard surfaces. DOFF – Superheated water at low pressure to achieve results without damaging the underlying surface. 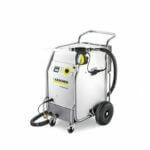 Dustless Blasting – Water and blast media under complete control to lift paint from any surface with ease. Dry-Ice Blasting – Non-abrasive, fast results suitable for wide ranging surfaces including electrical equipment. Get Your FREE Industrial Cleaning estimate in 3 easy steps.